Can Cuba build a bridge to its environmental future? Cayo Coco is one of a chain of islands in the Jardines del Rey archipelago, which spreads across a section of the northern shore of Cuba. It has long been known for its pristine landscape and diverse ecosystems. In the late 1980’s, as the power of the Soviet Union began to fade, Cuba began to look toward its own future, and an expansion of tourism revenue. Cayo Coco, with its mangroves, sand dunes, beautiful birds and crystal waters was a prime tourist attraction already, but it was decided that a highway linking it to the main island would offer easier access for tourists and provide better opportunities for developers of resort properties and golf courses. Accordingly, a stone causeway, about 12 miles long, was built across the shallow waters of Bahía de los Perros (Dogs Bay). Unfortunately, almost as soon as the causeway was completed, it was clear that its presence had created a number of serious environmental concerns. The mangroves began dying off, and habitat for the birds was being lost. The causeway was cutting off seawater and tidal flow that would normally have been coming in and nourishing the rest of the coastal area. Levels of salinity and water temperature were affected. Fish were dying. It was obvious to everyone that something needed to be done. In the early 1990’s, as a direct result of the ecological repercussions from the Cayo Coco debacle, the Cuban government began to make key changes. A new official state policy was announced, focusing on conservation, and new environmental laws were written into the constitution. Today, about 22% of Cuba land and a quarter of its marine habitat is protected by law, a percentage of safeguarded environment among the highest of any nation. Twenty-one coastal and marine protected areas have already been legally declared and more than 100 more are proposed, many of which are considered to have national significance due to the marine biodiversity value. It is a good result from a poor beginning. The future, however, is not entirely rosy. The Coco Cayo causeway itself continues to be a problem. Though its structure has been modified to ameliorate some of the damage caused by its original design, it continues to require high levels of maintenance because it is surrounded by water and vulnerable to the elements. In 2008, Hurricane Ike damaged fourteen of the causeway’s bridges and seven lighthouses, damage that has been estimated to require five years to repair. 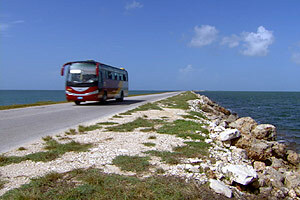 Between the environmental loss and the expensive maintenance, Cubans have paid a high cost for the causeway to Cayo Coco, especially considering that up until 2008 Cubans needed special permits from the government to use the causeway, while foreign tourists had free access. The ban has since been lifted, but Cayo Coco and its luxury resorts remain financially inaccessible to most Cubans who on average only make about twenty dollars a month. Cuba continues to change and grow. Tourism continues to thrive and development continues. If the U.S. embargo is lifted, it is expected that great numbers of American tourists will also arrive, which will put a strain on Cuba’s ability to enforce the environmental laws it has established. But Cuba has the distinct advantage of having been down this road before, which will clearly be a great help as it faces its future. That future poses both a challenge and an opportunity for Cuba to protect its remaining natural landscapes and to demonstrate a new model for environmental preservation.